Having an astronomical image is one thing, but aligning it to the pyramid needs a particular measurement from the pyramid itself for the scale to be correct, otherwise any sized image could be used, and would mean that any number of potential dates could be accepted because projections of passages, floor levels, the shafts and even the sides of the pyramid could fall upon any number of stars. The scale is found between the east/west axis alignments of the Queen and King chambers. In accepting that the Queen Chamber ridge line observes the pyramid's east/west axis, and also in line with the edge of the top step in the Gallery, measuring from this to the axis in the King Chamber gives a measurement of approximately 433.37". This is based upon Petrie's observations that the King Chamber has a mean width along the east wall of 206.29", taking into account the injury the chamber has suffered with slight gaps in some of the joints between the blocks, and the alignments of the north and south walls upon the east wall. Accepting that there is precision for the placement of all the features within and of the pyramid, one importance for the positions of the upper chambers offers up a singular reason for their east/west axes, and this most certainly relates to their horizontal distances apart. As the alignments of the projections of shafts, passages and floor levels extends to the identified greater boundary measurement of some 7,870" from the C.P. to the intersection of the Queen Chamber north shaft and the descending passage, it is easy enough to make calculations between the extent of the astronomy being viewed – or 360 degrees from one side to the other – and the approximate measure of the greater circular boundary of intersections defined in the model – or about 15,740” . The measurement of 433.37” initially offers it as a little under a one thirty-sixth part. As the boundary of the intersection of the lower north shaft and the descending passage is a band of some 220” in width, due to the floor and ceiling levels of both intersecting as they do, it is certain that there is a specific boundary within this band that is the true measurement; seeing the distance between the central axis of the pyramid and the central axis of the King Chamber as a certain measurement, multiplying the measurement by 36 will show the scale of the astronomical overlay according to the scale of the pyramid, ergo a span of 10 degrees. Taking the chambers and their axis lines as being 10 degrees apart, 1 degree therefore equals 43.337", and 360 degrees equals 15,601.32". The possibility of taking just .04" off the measurement from the edge of the top step to the centre of the King Chamber offers up 1º = 43.333"; 180º = 7,800"; 360º = 15,600". At the time of Petrie measuring the top step, it was in a damaged state because the top and face of it were well worn back, and a true edge had to be judged and aligned from which to measure against. Even taking just .02" from the exactness of the proposed edge of the top step, and the same from the measurement within the King Chamber, gives the .04", and for such a fraction of an inch being proposed here, it is not a hard thing to do. 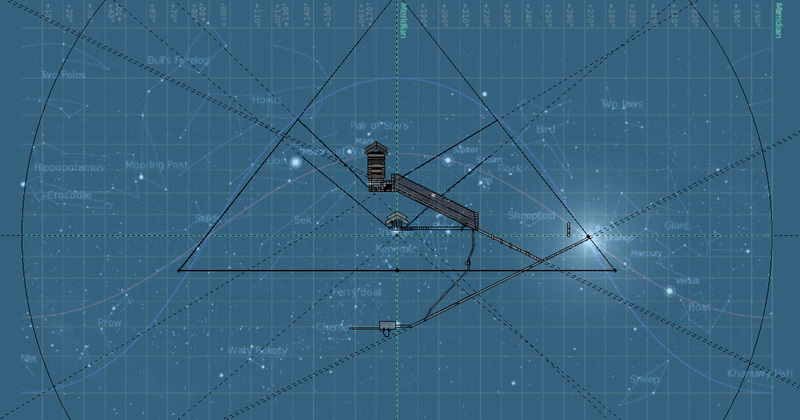 Accordingly, the astronomical overlay is scaled so the 360 degree horizontal measurement equals 15,600 inches. As we are defining circular boundaries and bands to specific intersections that were defined earlier, 7,800" is the radius of the great boundary that the pyramid identifies, and is referenced to by the intersection of the projected alignments of the north shaft of the Queen Chamber with the entrance passage, with a proposed band of 7,650" - 7,870". It appears that this interplay is reliant upon the measurement between the axis planes of the King and Queen chambers and the scale of the overlay, and cannot be mere coincidence. A secondary association for this measurement can be found in the Queen Chamber itself: Petrie defines the measurements of the length and breadth of the chamber as being an average of 226.47" by 205.85". Curiously, he also gives another measurement for the length, of 227.47" being found between the bases of the walls beneath the roof ridge line: 205.85 + 227.47 = 433.32. Through all the measurements Petrie obtained and recorded, certainties and averages spell out that the sum of length and breadth can be said to equal 433.33". The following image shows the overlay of the sky portrayed in 12,118 BCE with the southern meridian upon the central axis of the pyramid as viewed from west through east, and showing the projected alignments of passages and shafts; the horizon line beneath the Queen Chamber; and the circular boundary of 360º with a diameter of 15,600”. The triple intersection of ecliptic, equator and horizon occurs while the Sun is just below the horizon, just before dawn, allowing for the overlay to show the Sun in the entrance passage. 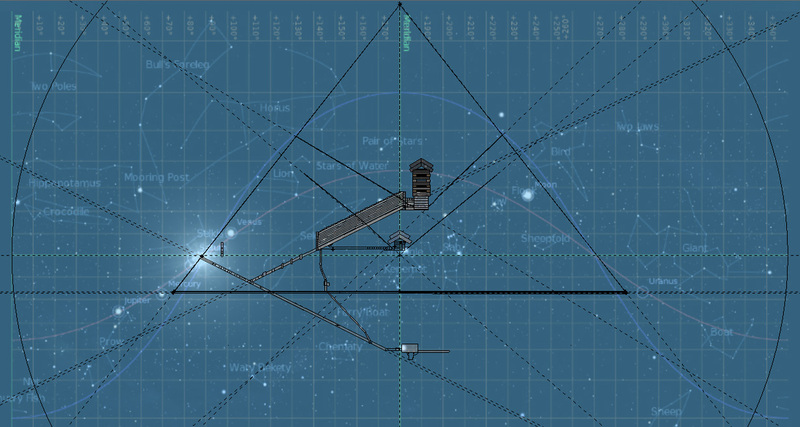 For the moment, just seeing what this overlay shows is as simple as zooming in on various parts and observing. Firstly is the position of Sirius and in the enlargement of the image below we see Sirius upon the centreline within the niche, resting upon the floor-level of the chamber. This position, being approximately half a degree off the meridian, affected which dates of the astronomy were appropriate for offering potential overlays to place upon the pyramid. In the earlier attempts to even imagine that there was a possibility a plan for the pyramid might have come from a flattened projection of the entire sky, it became evident that the stars progressed through the sky and held differing positions at differing times. It was also evident that any star, and a star such as Sirius, could acquire the same longitude position while being at a different latitude. By having the correct scale, it was easy enough to define that the centre of the niche was 0º 33' 33” from the axis of the chamber. This observation was instrumental in focusing upon Sirius, and eventually seeing that there were two possibilities for the orientation of the pyramid when it came to placing the overlays upon it. In the image of the overlay, the southern meridian is upon the east-west axis of the pyramid and the horizon is below the chamber on the level between the 20th and 21st courses. This meridian/horizon intersection is the centre point - C.P. - from which all boundaries to features of the pyramid and intersections of passages and shafts are made. 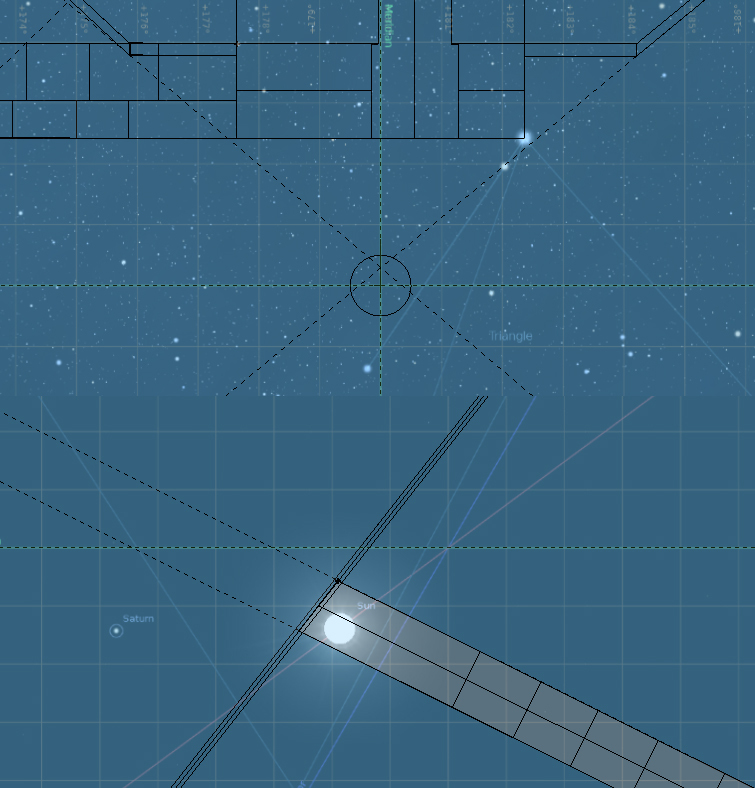 The grey lines radiating down from Sirius are part of the constellation Triangle, which is part of Kenemet. The double-dashed lines are the projections of the shafts. The image below shows the Sun within the entrance passage on this date and just before sunrise. The Sun is upon the ecliptic which can be seen to angle upwards where it meets the intersection of the equatorial line and the horizon. Certainly the view could show the Sun exactly upon the triple intersection of horizon, ecliptic and equatorial lines, and this would show dawn of the equinox. For these initial views though, having the Sun within the entrance passage is to show its relative position against the form of the pyramid. As we know that Precession can affect the position of the Sun upon the horizon by up to half a degree, it can be seen that the Sun could occupy the very intersection of casing and passage, and in such an overlay, does offer an interpretation of the Sun being 'born' from the passage as it passes from night to day. The triple, dark lines of the casing - seen as such due to the angled view being given from the software abilities - is seen meeting the entrance passage, with the projected angle of the passage extending upwards to the left. 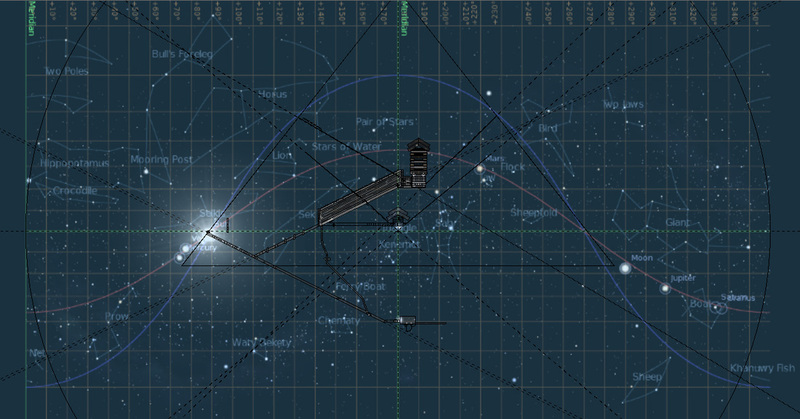 The grid pattern shows individual degrees of the astronomical overlay. At this level, the horizon expressed upon the pyramid appears to measure approximately 183 degrees from one side of the pyramid to the other, and measuring upon the model at the intersection of the horizon with the casing sees the measurement as being 7,925.29“. The lines within the entrance passage indicate the blocks that make up that part of the passage, with the centreline extended to the casing. Other particulars that can be defined from the overlay upon the pyramid are the location of Canopus resting just outside the Subterranean Chamber and above the passage leading to that; Vega on the left, upon the 360º boundary; the ecliptic arcing through the topmost course of blocks in the relieving chambers; and the projected alignments of passages and shafts just miss particular stars, such as Mirphak of the Bird/Perseus; Hadar, to the bottom-left of Waty Bekety, while beta Mon, being the tip-star of Sah's staff, rests within the south shaft of the Queen Chamber. It is a beautiful thing to behold, but not exact all across it. 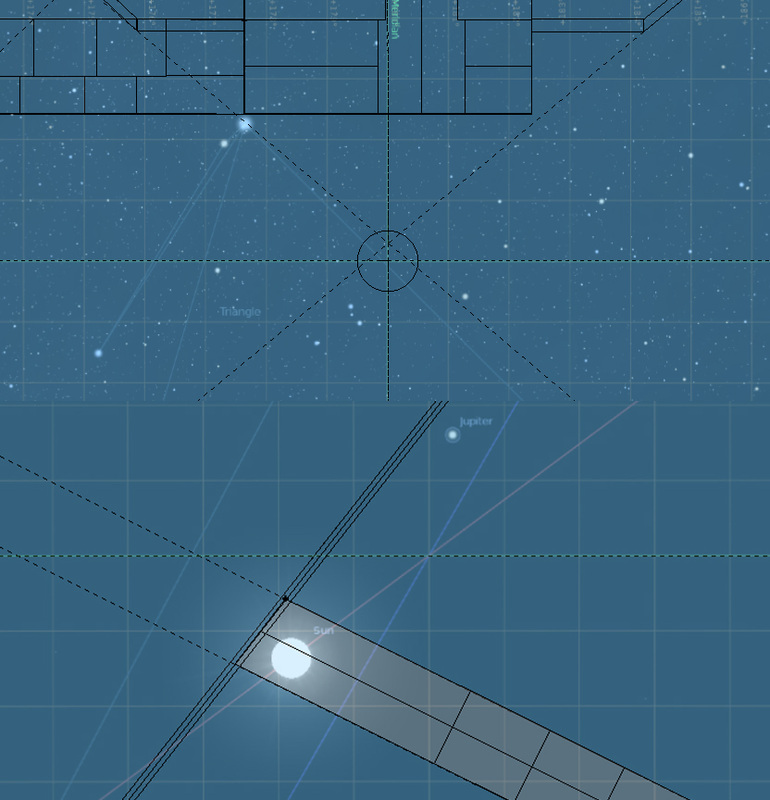 The position of the Sun does show proof to the scale of the overlay being based upon the measurement between axis of the King and Queen Chambers, as the size of the Sun as viewed from Earth is approximately half a degree, and while the size does change according to a zooming effect in Stellarium, certainly the size of the entrance passage can accommodate two widths of the Sun. While searching through various dates and seeing the location of the Sun within the passage, it became evident that having the TI being observed had the Sun at slight differences of exact position within the passage, but certainly it ranged between the lower part – as in the above image – to the higher part. This might be a consequence of Earth's obliquity being included towards the passage-size. While July 2nd, 12,118 BCE just before dawn is an exceptional date to use upon the pyramid, and considering the Sun and especially Sirius as playing already important roles in this analysis, there is of course the 12,020 BCE date to be assessed, shown in the following image with the projected alignments of the pyramid. As there are two possibilities for the orientation of the pyramid, having Sirius on either side of the meridian and in the location of the niche when the overlay is performed began the observations of how an overlay interacted with the pyramid's architecture. 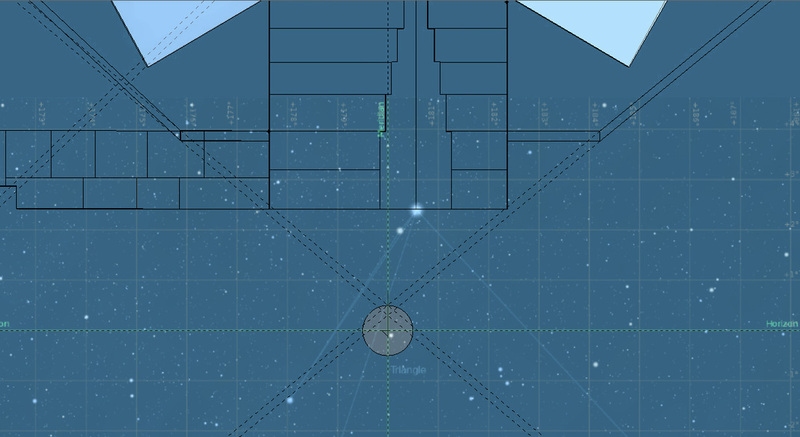 This overlay initially seemed like it was the way to go with the orientation of the pyramid, especially considering several stars positioned in certain areas: Sirius nearly upon the centre of the niche while being on the floor of the Queen Chamber; Mimosa of the Waty Bekety constellation being within the Queen Chamber north shaft alignment; Betelgeuse and Mintaka within the Grand Gallery, while Rigel is upon the floor level of the Queen Chamber; Phad of the Bull's Foreleg very close to being within the south shaft of the Queen Chamber; and several other stars within proximity to other projected alignments, but in further investigating subsequent time periods, the precessional movements of the stars crossing the horizon leftwards meant that the pyramid's orientation was incorrect. Subsequently, I could only accept that while this moment in time was indeed an important moment, its reference to the pyramid was one sided, although perfectly one sided as not to be disguarded from the analysis. Of course, like the earlier arrangement that mirrors this one with Sirius in the niche in 12,118 BCE, the horizontal alignment of Vega and Aldebaran passes exactly through the upper wells within the Ante-chamber. Basically, it all came down to which side of the meridian was Sirius, and hence which orientation to have the pyramid in for the overlays to properly interact upon the architecture. The location of the Sun also was pondered: was it more important to appear entering the pyramid, or exiting it? While both are valid, being 'reborn' seemed a more important depiction. Having found that Sirius overlays as it does within the chamber, and upon the floor level, adjusting Stellarium to show the positions of Sirius before and after 12,118 BCE showed two further moments that have an impact upon the overlays over the pyramid. The first date is 12,275 BCE, July 3rd, while the second date is July 2nd, 11,862 BCE, again with the Sun just below the horizon at dawn and the triple intersection of horizon, ecliptic and equator still being observed. During this period of time, it seemed that having the horizon intersected by the ecliptic and equatorial lines was showing an exacting view of the cosmos that meant the stars held their particular positions, and to have any date and time being viewed would not matter too much as long as the triple intersection was exact. In other words, showing the view in 12,118 BCE on a different date or a different time than what is presented could have the cosmos rotated either backwards or forwards, and the TI would not be observed. Having the TI observed always, and having different dates or times and upon a flattened view of the cosmos as presented above, would show the stars slowly migrating to the left because of the actions of Precession. To have a different date or time would show the Sun either higher or lower than upon the horizon; just as long as the TI was observed would always show the cosmos laid out so that Sirius held a prime position that overlaid within the chamber. On the 12,275 BCE date, Sirius crosses the southern meridian at 2º 30' 02" above the horizon; in 12,118 BCE, it crosses at 2º 23' 50"; and in 11,875 BCE, it crosses at 2º 20' 12.62". Between 11,883 and 11,866 BCE, Sirius is below 2º 20' 13", with the date of April 15th 11,875 BCE being the lowest latitude that Sirius will reach through all its movements as it crosses the meridian above the horizon. In relation to the actual floor of the chamber, we can be certain that the level equates to approximately 2º 23' 36” above the horizon, and Sirius resting on this level within the chamber can occur during this spread of time because of the arc it moves through, with the 12,118 BCE moment having Sirius resting upon the floor within the middle of the niche while the TI is observed. Conversely, Sirius also comes upon this exact location in approximately 11,628 BCE but the TI is not observed. It can be seen that locating the moment when the triple intersection of horizon, ecliptic and equatorial lines occur is paramount to identifying when Sirius is to be particularly important in relation to the Queen Chamber and consequently the location of the niche. Astronomically speaking, it is a momentous occasion on this date in 11,875 BCE for this stellar occurrence with Sirius defining the lowest position it will hold as it passes across the southern meridian, but certainly the maximum would also be a momentous occasion, and according to Stellarium it occurs on September 24th, 627 CE: on this date, Sirius will reach its highest position as it crosses the southern meridian, attaining a latitude of 44º 18' 08.5", or 44.30236º. It is interesting that the angle of the upper south shaft is seen to be 44.4383º at 720” to 840” down the shaft, while an estimated 'true' angle – from the first angle after leaving the chamber to the shaft's proposed exit point on the casing - of 44.052º. The particulars of this highest position will be identified later, as well as further aspects concerning the movements of Sirius through the sky and within the pyramid, but it is suffice to say that these dates in 11,875 BCE and 627 CE identify the extreme locations of Sirius upon the southern meridian as our wobbling, rotating, Sun-orbiting Earth affects a long term view of our sky. On April 15th 11,875 BCE, the Sun will be some 4 1/2 hours risen on this date if the perfect triple intersection is still observed, but placing the Sun at the corresponding point for being within the entrance has the date of June 30th, and this places Sirius some 2.25º before the southern meridian, and several inches inside the chamber. Adjusting the years earlier and still observing the triple intersection finds Sirius exactly in alignment with the entrance to the chamber on June 30th 11,862 BCE. On July 3rd, 12,275 BCE, with the overlay upon the pyramid, Sirius rests exactly upon the corner of the southern wall meeting the floor inside the Queen Chamber. The images below show the extremes of Sirius within the Queen Chamber, and the Sun at the entrance, for the 11,862 and 12,275 BCE years. With a 413 year span between the two years being depicted as referencing the size of the Queen Chamber, it is interesting that the King Chamber is as wide as approximately 206.43", and as long as 412.78", but this might just be coincidence in relating time span with chamber size, although a further comment about this will occur in a later section. When the 12,275 BCE overlay is placed upon the pyramid, the interaction between the two is more solid, especially showing the north shafts converging toward the star Megrez. It appears that the first indication of a plan for the pyramid comes from this year-date, and the image below shows the overlay upon the pyramid, making a better fit for astronomical alignments to the shafts, even though their exact angles are thus far estimated to being close to their true angles, despite using either Petrie's or Gantenbrink's angles exclusively. The importance of Sirius upon the whole is identified in the location of the niche within the Queen Chamber. It has always been a quandary as to why the niche was placed as it was, not centred within the chamber but its own centre offset by some 24" south. According to the overlay of 12,118 BCE and its mirror-image of 11,939 BCE, Sirius rests upon the centre of the niche, exactly at the floor level. With the overlays of 12,275 BCE and 11,862 BCE, a path of travel for Sirius is seen to progress across the chamber, and is aligned upon the southern meridian/east-west axis of the pyramid on July 1st, 12,068 BCE. On the one hand, the shape of the niche and its position seeks to identify Sirius at particular moments as it courses through the sky, and can be seen to progress ever higher within the niche as the years pass by. On the other hand, Sirius is not the only star that moves in such a way, and as was noted that 627 CE would see a moment when Sirius reaches its highest altitude above the horizon, another important star also plays its part within the chamber and the niche: Canopus. In 12,275 BCE, Canopus is within the Subterranean Chamber but as the years pass by, it does attain the Queen Chamber and by 627 CE, finds itself resting within the upper part of the chamber at about the height of the ridge line of the roof. This will be addressed further along but for the now, to judge whether the right path has been found in applying such an overlay to the pyramid, we must weigh up the correlations between the astronomy and the architecture.